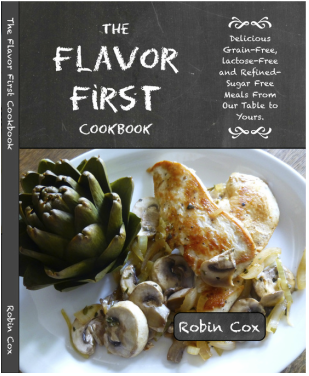 The Flavor First Cookbook - No More Crohn's For Me! We believe that food has to taste great - bottom line! So that's why we named this cookbook "The Flavor FIRST Cookbook." Flavor comes first in every recipe, THEN it has to conform to the Specific Carbohydrate Diet. Sound good? So now you've got a great cookbook from NoMoreCrohns that you can open and flip through the pages! Bound in a quality library style paperback edition with non-shiny, quality paper, you can open it and work right from the book. Published and sold through Amazon, the book will be created and mailed as soon as you order it! Our cookbook includes more than 110 delicious recipes gathered with flavor, freshness, and ease of preparation in mind, and mouthwatering photographs of every finished dish to whet your appetite and inspire you. Every recipe is compliant with the Specific Carbohydrate Diet and is grain-free, lactose-free, gluten-free and refined-sugar free - perfect for taking your life and health back! Click the cookbook cover picture to order. For someone like me wanting, no, needing to follow the Specific Carbohydrate Diet, this book is a Godsend! If you have ever read "breaking the vicious cycle" and wondered... "How can I make this diet work?!? then this book will help tremendously. The book has a photo for every recipe presented. (It's even on the same page!) And the food tastes really good! I hade been following a more standard diet recommended for people with Inflammatory Bowel Disease/ IBD. It was rather boring, and did not always work for me. Now my intestinal cramps normally associated with my U. Colitis are gone, and I am gradually doing better. Once you master the basic skills explained in this book for how to cook SCD legal food, you will be able to cook even more on your own. Highly recommended." "The recipes are delicious and easy to make. They are also very satisfying due to the flavor combinations. I really liked the photos of the food too." "I have developed a corn by-product allergy & found that this wonderful cookbook, " The Flavor First" , gives me so many tasty options that eliminate exposure to my sensitivities. When I developed this allergy & thus began carefully reading labels... I was appalled that it was prevalent in a majority of foods on the shelf. ... Even a bag of frozen mixed vegetables had cornstarch added to prevent them sticking together!! ! I began eating very simply... No prepared sauces, dressings, mixes, bread or bread products... In other words very limited!! Thank you for your research & effort in this area & your creativity in coming up with these amazing recipes that are delicious, beautiful on the plate & I Can safely eat & enjoy without fear of having a reaction!! This cookbook is not just for people with Crohns or gluten sensitivity...It is a MARVELOUS reference also for those with CORN BY-PRODUCT sensitivity!!" From a young age Robin Cox was interested in cooking, and this passion developed over the years as she raised three daughters on delicious homemade meals, hosted church groups and foreign students, and directed the cooking for large events. When her daughter Erin was diagnosed with Crohn’s Disease in 2001 and began the Specific Carbohydrate Diet, Robin tackled the challenge of making delicious meals that were free of grains, lactose, gluten, and refined sugar for her. What at first seemed like a daunting task soon blossomed into many delicious possibilities under Robin’s expert hand. Her love for foreign cultures and flavors, can-do attitude, and knowledge of what makes a great recipe combine to enrich the grain-free, lactose-free, gluten-free, and refined-sugar free community with more scope for the taste buds. Robin hopes this cookbook will provide abundant inspiration for cooking and enjoying good food with people you love around your own table.